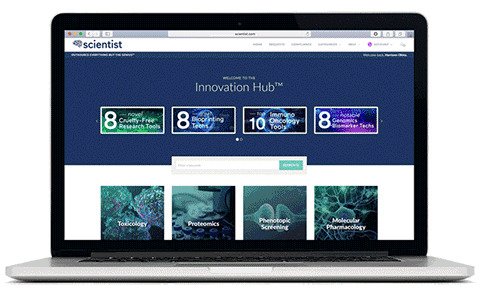 SAN DIEGO--(BUSINESS WIRE)--Scientist.com, the world's leading marketplace for outsourced scientific services, announced today the launch of the Innovation HubTM, an online repository of cutting-edge life science research tools and services. The Innovation HubTM includes hundreds of the latest advances in gene editing, 3D bioprinting, nanotech, organ on-a-chip, next generation DNA sequencing and whole animal imaging technologies. The collection is available exclusively to registered users of the Scientist.com marketplace. The platform uses a music-app style recommendation system that categorizes commercialized tools and services based on popularity and potential research applications. Its unique supplier network includes commercial CROs, academic core facilities, individual academic laboratories and nonprofit facilities.